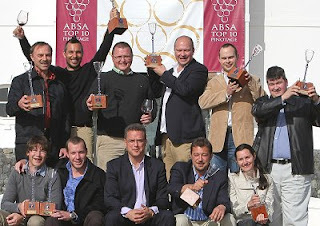 Results of the 2009 Absa Pinotage Top 10 Competition were announced today 27 August at a ceremony following lunch at Val de Vie Wine and Polo Estate near Paarl. Half the wineries represented are first time winners: Altydgedacht, Darling Cellars, Flagstone, Lyngrove, and Viljoensdrift. Kanonkop wins for their eighth time and Beyerskloof for their fifth with the second vintage of Diesel which has also been awarded 5 Stars in the 2010 Platter Guide. This year there were 139 wines competing, the 2nd highest number of entries, and these included three wines from New Zealand, the second year running the competition has attracted international interest. This year’s judges were Duimpie Bayly (convener), Francois Naudé, Allan Cheesman, Neil Pendock, Wendy Burridge, Chris Roux and Gert Boerssen who over two days drew up a short list of 28 wines from which were selected the winners and 10 runners-up. 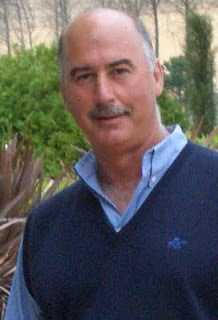 Co-judge Neil Pendock said it was a hard task to select the top 10 from the final 28 wines. Allan Cheesman, former Director of Wine for UK Sainsbury’s supermarkets said that he'd been tasting wine for 37 years and this was a great experience with all the superb wines. The winners of the 2009 Absa Top 10 Pinotage Competition share with their award. Front from left are Anri Truter (Beyerskloof), Francois van Niekerk (Windmeul), James Slabbert (Managing Executive of Absa Corporate and Business Bank), Fred Viljoen (Viljoensdrift) and Danielle le Roux (Lyngrove). Behind from left are Abé Beukes (Darling Cellars/Onyx), Clinton Le Sueur (Longridge), Abrie Beeslaar (Kanonkop), Etienne Louw (Altydgedacht), Gerhard Swart (Flagstone) and Thys Loubser (KWV/Cathedral Cellar). Earlier than usual the Platter team have announced the wines awarded five stars in the forthcoming 2010 Platter Guide, due for publication end of November. Beyerskloof's Diesel Pinotage 2007 is the sole varietal representative in the list. The Platter Guide annually tastes and rates more than 6,000 South African awarding from zero to a maximum of 5 stars. Very few wines achieve the highest score which indicates a wine the tasters agreed was 'superlative, a Cape classic'. For the 2010 Guide there just 43 five-star wines, which includes 7 fortified and dessert wines. Congratulations to Beyers Truter (pictured right) and his team at Beyerskloof. The first vintage of this barrel selection wine, named after Beyers' recently deceased and much missed dog, the 2006 vintage was a Pinotage Top 10 winner last year. Bertus Fourie is the winemaker who achieved fame, and some say notoriety, for launching the coffee’n’chocolate Pinotage style upon the world while he was working at Diemersfontein. Some purists object that it is not varietally correct, but there is no doubting that Diemersfontein’s Pinotage is hugely successful and has introduced many people to the delights of Pinotage. Bertus, by now nicknamed Starbucks, moved on to KWV for whom he created their mocha toned Café Culture Pinotage. One of the people he met was Martin Venter, developer of Val de Vie Lifestyle Polo Estate, who offered Bertus the position of managing director at associated Val de Vie Wines in 2004. Val de Vie specialises in Rhône style wines, so when Bertus and Martin got the itch to create their own coffee Pinotage a new label was called for, and Barista is its name. 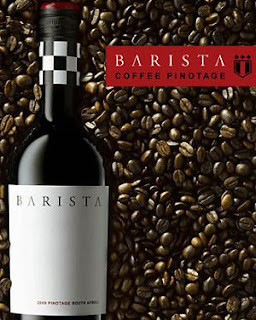 Barista Coffee Pinotage 2009 will be released soon, marketed by Vinimark in South Africa, and I hope to taste it soon and report back. This 2006 is a different beast being very approachable and well balanced with tannins well restrained on opening and an ideal wine with enough body to match food. The wine opens up in the glass showing ripe cherry flavours. 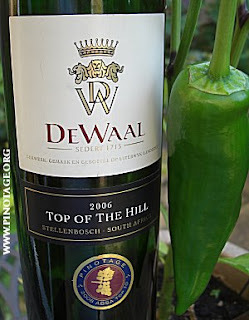 The Top of The Hill is made for aging, and I think I’ll put away my remaining bottle to see how it develops, as the few dregs of this bottle were showing intriguing spices and plums when I emptied them the following day. A well deserved Top 10 winner in 2008. What relevance does the diversity of vineyard sites on the farm have to with this specific wine? 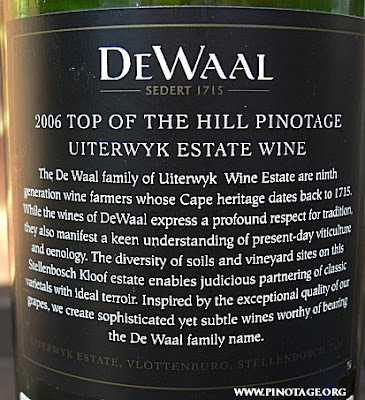 It is a single vineyard wine from a named vineyard which happens to be on the top of a hill, not in a ravine as kloof implies. Not only that, but the historic Top of the Hill vineyard is planted with the world’s oldest Pinotage vines. I’d have thought that was worthy of mention. 2009 is been a very good vintage. Our yields are up from the previous vintage and our red wines show clean fruit flavour with excellent soft tannins. Pinotage and Shiraz would be classed as our premium red cultivars. Our Pinotage Barrel Selection could be described as a multilayered complex full-bodied wine which was matured in first fill French American 225 litre barriques. Being a rather cool climate area our Pinotage lean more to fresher style that brings out strawberry, raspberry, cherry aromas well balanced with integrated bouquet of vanilla butterscotch and cherry tobacco. Ageing potential of about 10 years and recently rewarded with 2009 Silver Decanter Medal. Anura is not a winery I’m familiar with. They bottled their first wine in 2001 and in 2008 won Pinotage Top 10 with this, their 2007 vintage. I opened my first bottle of Anura last night and heartily concur with the Top 10 judges. This is a very good wine. Packaging is not quite there. The bottle is a classy heavy one and the front label is good, but the rear label has a blurb printed in tiny dull gold against black that is difficult to read and is confusing. Resorting to the Anura’s informative website all becomes clear. Anura means frog, which explains the image on the front, and is taken from the name of a hill on their farm. We used to find frogs in our garden when we had a small pond but that is now filled in and planted with courgettes and beans that get eaten by unseen predators the moment they emerge from their flowers. However a benefit is that we no longer find mutilated frogs after mowing our lawn. I was expecting a DIAM technical cork at the end of my waiters’ friend but found a smoothed natural cork which was stained with wine along its length and top. So I was concerned for a while about the seal. 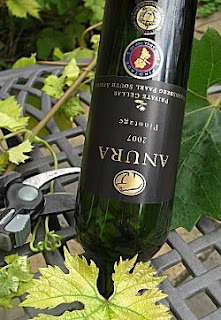 Although some of Anura wines are available from Anura's fullfilment partner in Europe, the 2007 Pinotage isn't one of them, and I can't find any stockists in Europe or the USA, but Grapeland in England list the 2005 vintage Pinotage.